AREAWIDE — In support of students across the country, a March For Our Lives event will be held at Two Wrasslin’ Cats, 374 Town Street, East Haddam, on Saturday, March 24, from 10 a.m. to 12 noon. 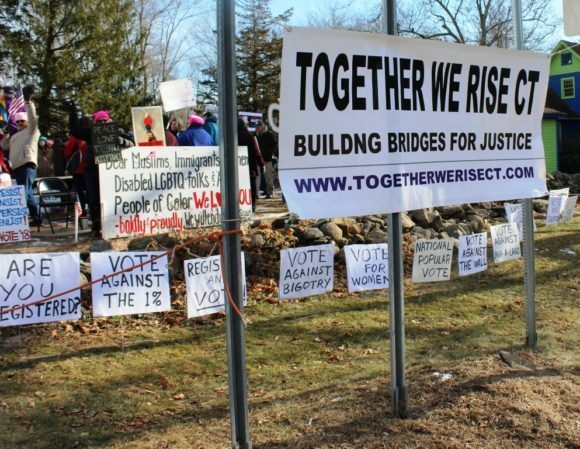 Hosted by Together We Rise CT – Building Bridges for Justice, the event will be one of more than nearly 700 world-wide. March For Our Lives was created, inspired, and led by students who will no longer risk their lives waiting for someone else to take action to stop the epidemic of school shootings. March For Our Lives believes the time to take action is now. Students across the country are leading the way, and Together We Rise CT is proud to follow their lead. All are welcome to join them for a peaceful vigil of commemoration, featuring youth speakers and music, as everyone stands together in non-violent witness. Participants are requested to bring peaceful signs or banners only — and no pets. RSVP at http://act.everytown.org/event/march-our-lives-events_attend/8903. If you wish to volunteer or have questions, e-mail togetherwerisect@gmail.com.